LANSING — Many of the men and women who sit on the boards that oversee Michigan’s public universities have made names for themselves in business or politics. Many also happen to be generous campaign donors. Of the 80 individuals who currently hold appointed positions on university boards, 45 — or about 56 percent (PDF) — contributed financially to the campaign of the governor who appointed them, according to campaign finance disclosures. As for those who hold seats on the state’s three elected university boards, many of them are prolific donors as well. The governor has the power to appoint members to boards that oversee 10 of Michigan’s public universities. For three universities — Michigan State University, University of Michigan and Wayne State University — voters elect board members. Currently, state lawmakers are considering whether to allow the governor to choose board members for those three universities as well. The proposal comes as the board that oversees Michigan State University faces criticism for the university’s handling of Larry Nassar, a former university doctor convicted of repeated sexual abuse. 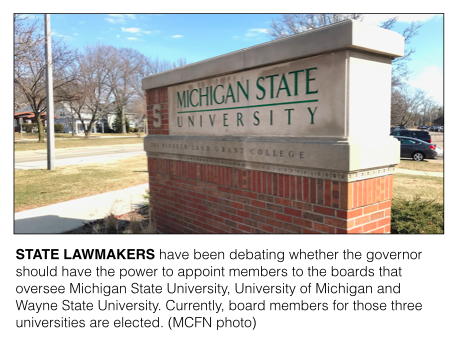 If lawmakers advance the proposal to change how university board members are selected, state voters would have to approve the switch because the proposal would amend the Michigan Constitution. Some opponents of the idea are concerned that the change would give the governor greater ability to reward well-connected individuals with sought-after positions leading the state’s largest universities. 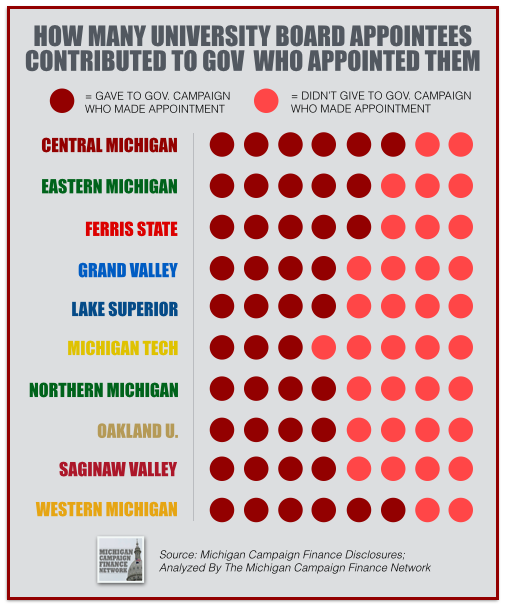 According to the data, about 56 percent of the appointed university board members made at least one contribution to the governor who appointed them either before or after they were appointed (see our work at this link PDF). Thirty-two of those board members — or 40 percent — have given at least $1,000 or more to the campaigns of the governor who appointed them. On two of the 10 boards, donors to the governor hold six of the eight positions. Those are the boards for Central Michigan University and Western Michigan University. The largest campaign donors to Gov. Rick Snyder serving on the appointed university boards are William Johnston, chairman of Greenleaf Trust who’s given Snyder’s campaign account $11,200, and John Kennedy, president of Autocam who’s given Snyder’s campaign account $10,200, according to campaign finance disclosures. Johnston is on the Western Michigan board. Kennedy is on the Grand Valley State board. Asked about the number of contributors serving on the appointed university boards, Ari Adler, Snyder’s spokesperson, said Snyder appoints many different people from different backgrounds to boards and commissions. Snyder has appointed or re-appointed all but two of the 80 board members currently serving, according to MCFN’s analysis. Two of former Gov. Jennifer Granholm’s appointees are still serving. Both of those appointees financially supported Granholm’s campaign fund, according to disclosures. Snyder has appointed some well-known political figures to the boards, including Rich Studley, president and CEO of the Michigan Chamber of Commerce, who serves on the Central Michigan board, and Bobby Schostak, former chairman of the Michigan Republican party, who serves on the Oakland University board. Snyder also appointed Michael Hawks, director of the multi-client lobbying firm Governmental Consultant Services Inc., to the Eastern Michigan board, Tricia Keith, executive vice president of Blue Cross Blue Shield of Michigan, to the Central Michigan board, and John Russell, former president and CEO of CMS Energy, to the Grand Valley State board. All five of those individuals contributed to Snyder’s gubernatorial campaign committee at one time or another. As for the elected university boards, they include fewer Snyder donors but they do include many well-established political donors in Michigan. Under the current process, the state parties nominate individuals to serve on the elected boards, and then voters choose the winners. Some lawmakers have argued that process leads to partisan nominees who are able to win over party insiders. The 24 members of the elected boards have made $1.6 million in political contributions at the state level since the beginning of 2010, not including contributions to their own campaigns, according to campaign finance disclosures. Ten of them have given out more than $10,000 in disclosed political contributions. These numbers don't include contributions to candidates for federal office or to committees focused on federal races. The wide majority of the tracked contributions — $1.0 million — were made by Michigan Republican Party Chairman Ron Weiser, who serves on the University of Michigan board. David Nicholson, CEO of PVS Chemicals, has made $218,799 in political contributions at the state level since the start of 2010. He serves on the Wayne State board. And Mark Bernstein, an attorney with the well-known Sam Bernstein Law Firm, has made $162,622 in contributions. He serves on the University of Michigan board. For the 2015-2016 election cylce, the Weiser family ranked fifth of all Michigan families for disclosed political contributions (including state and federal contributions), according to MCFN's tracking. The Nicholson family ranked 10th. The Bernstein family ranked 36th. Denise Ilitch, president of Ilitch Enterprises, serves on the University of Michigan board. Her family ranked 40th for political giving, according to MCFN's tracking.